Continuing my theme of new bikes launched at major races I have turned my attentions from the Bianchi Infinito CV ridden at Paris Roubaix to the Pinarello Bolide which is making a few waves at the Giro d’Italia this year. 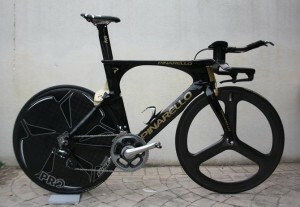 The Pinarello Bolide was launched with great fan fair just before the start of the Giro with rumours that Bradley Wiggins would ride it in the time trial stages of this years race. However the team time trial came and went with no sign of the new machine. Further rumours circulated indicating that there were problems with the scrutineers and the fairings covering the rear brakes, even though the introduction of UCI approved stickers were due to solve this sort of dispute. Nevertheless the Individual time trial came round and and sure enough Bradley was riding the new Pinarello Bolide… until a quarter of the way through his TT when it was ditched at the side of the road in favour for the Pinarello Graal. Bradley’s weapon of choice in last years Tour Olympics double. From the untrained eye he seemed to look more at ease on the Graal for the remainder of his ride and he finished 2nd, just behind Alex Dowsett who has recently moved from Movistar and you guessed right, are also sponsored by Pinarello and was riding the tried and tested Graal. So why did Sky opt for the Pinarello Bolide at such a key moment in Bradley’s Giro campaign? Was it marketing? or marginal gains?